Noodles are consumed in various forms across the world. As a child, I always used to love instant noodles from Maggi and Ramen brands. Some of the best known and delicious noodle recipes come from the south-east and East Asia. Some of them are tangy, some are mild, while others are extremely spicy. Today, I'm going to share a variant of chili garlic noodles by adding some shrimps and some extra spices to add the punch. This preparation can be taken as a main course meal. You can moderate the number of spices used in this preparation. Instead of using regular noodles, you can also use egg noodles. 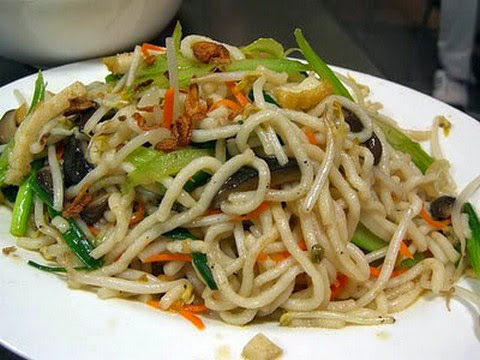 So let's get started and see how to quickly prepare this delicious garlic noodles recipe. Enjoy hot and spicy chili garlic noodles loaded with scrumptious shrimps that are seasoned to perfection to make this noodle recipe, a perfect main course meal. 1. Take six cups of water and bring to boil. Add noodles and cook for 3-4 minutes. Pour cold water and drain all the water. Keep aside. 2. Boil shrimps in 4 cups of water for 2-3 minutes. Drain all the water and keep aside. 3. Heat oil in a large pan and add spring onion and carrots. Toss it till light brown. 4. Add noodles, finely chopped green chillies and suate for about a minute. 5. Add shrimps, soy sauce, schezuan sauce and chilli oil. Toss and saute for 2-3 minutes. 6. Add garlic, lemon juice and salt. Cook till shrimps are completely tender (about 3 minutes. 7. Serve hot garnished with ginger julienne.